We cannot forward email addresses without your authority. Using this alternative page will give us that authority. I want to try and establish when Lyons put Hornimans livery on vehicles what the colours were. I wondered if they were similar to the tea packets and cards? Does anyone know when this Lyons Maid button was issued or what P&H stands for? Peter asks 'Could this be Royal Doulton?' 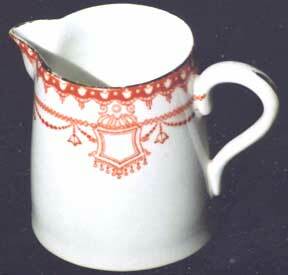 Comments from readers would be appreciated This small china cream jug, measuring 2.5 inches tall and a top rim diameter of 1.8 inches, gives some idea of the high standard of china tableware used in the Strand Hotel, London. The rim and handle are gilded. It dates from the late 1910s and the base shows a makers mark of Rd 539135. Could you please give me some information on this lyons moneybox it's been in the family years and nobody knows anything about it. I have a small 2" diameter glass bowl. It could be a salt cellar. 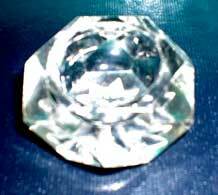 It has a round bowl with an eight sided star design in the base and six sided in shape - there's a picture of it below. I remember it being at home when growing up and always thought it was a small candle holder. However, one day I discussed it with my mum and she said it was from a J.Lyons teashop or corner house and that it was used for holding salt on the table. I wondered if anyone can confirm this. 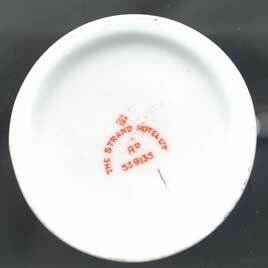 There is nothing on it to determine that it came from a J. Lyons teashop/corner house. It must be from the 1950s or even earlier. I'm attaching a picture of a Maison Lyons Toffee tin. Hopefully someone may be able to shed some light on it for me please. It is the same tin, with the lid next to it. The piece with the bars on it slots over the other, and then you can twist it around and see all the different animals behind the bars. There is not very much to say about this except that the product was sold in the Lyons up-market restaurants known as Corner Houses. These Corner Houses (there were only four in London: Coventry Street, Strand, Tottenham Court Road and Marble Arch) had large shopping areas on the ground floor where high quality food could be obtained (hams, hand-made chocolates, wines, fruit, biscuits, coffee, tea etc). Your tin appears to be a 2 lb tin (possibly 3 lb or 4 lb) and it would have been purchased before the start of the Second World War, about 1936/7. A 2 lb tin cost 2/- which was quite a lot for working class people at that time. In fact working class people could not afford to shop in the Corner Houses. In today's money this would be 10p. The toffee was made at the J. Lyons confectionery factory at Greenford in Middlesex and was sold to the retail trade in smaller quantities. The bakery salesmen with their horse-drawn vans also sold to the public direct. I am sorry not to be more helpful but hope that these few comments will help. Some detail of the Corner Houses can be found on the Lyons website but you may want to obtain a copy of The First Food Empire which contains more information. I'm a collector of teabag-wrappers. By wrappers I mean the paper or foil sealed printed envelop around the teabag. I collect this now 6 years and have more than 12.500 different teabag-enveloppes in my collection. Now my question is can any of your readers please help me obtain some Lyons teabag-enveloppes for my collection. I have just purchased for £5 an album "Wings of Speed" containing 24 cards depicting "50 years of Air speed Record Breakers". These cards were presented free in Lyons Tea Packets. Do you know when these were issued? The original price on the album is sixpence. There are a couple more in the shop - one on ships and one on Australia. In the trade these are known as Trade Cards to differentiate them from Cigarette Cards Lyons produced some 45 different sets of cards dating from 1926 until 1979. The 48 card set of Australia is catalogued at £4.00. Wings across the World at £3.00. HMS 1902-1962 between £2.50 and £4.00 depending on whether they have descriptive backs. The earliest set of Tricks and Puzzles (1926) is valued at £250 catalogue. The illustrated map of the UK is valued at £23. international Footballers at £110 and Star Trek £95. I have a Lyons Coffee maker which I think is quite old. Its model reference is PSEL and serial No 3887D271 and, according to the metal plate on the back, was manufactured by William Still & Sons of Fellows Road, Hastings for J Lyons & Co Ltd. I seem to remember these from my childhood in station buffets - can you tell me how old it is and if it has any value? I know that all the Teashop tea boilers were made by William Still & Sons but that's a much bigger thing. I think we might be able to beat the last tin of coffee (see Chris Hackworth). We have a green tin priced at 1 shilling and two pence. Also it has appointment to the late king George V. The address is Cadby Hall London W14. Have you any info on this? The Green Tin coffee was introduced after the Yellow and Green type (Chris Hackworth) but precisely when I know not. The price of 1/2d obviously dates the tin to prior decimalisation (15 February 1971). The royal appointment which Jackie and Graham refer to is not necessarily related to coffee. The J. Lyons company were awarded the Warrants at this time. It was certainly made at the Greenford Factory, Oldfield Lane, Greenford, Middlesex. It was a very popular brand and is still produced today in the same coloured tin. It is still one of the better coffee brands on the UK market. I do have an order form for the Tea Division (their salesmen were responsible for selling tea, coffee, and other groceries) dated 1964 and it appears on that. This question was asked by my wife to me, but after some thought I could'nt answer it. What was the name an ice lolly from the 60s or 70s it had a chocolate coating over ice cream with a chewy toffee centre, it probably was'nt even Lyons Maid but it was the most popular make of ice cream at that time. I would grateful if you could clarify this matter as it would help a of lot people get a good nights sleep. I suggest that he is probably thinking of a range called Pick of the Pops. This was launched on 17 June 1963 priced at 8d. It had a combination of coffee and advocaat flavours and was coated in milk chocolate with biscuit pieces. Then on 12 May 1969 Lyons Maid launched Luv, a similar lolly to FAB. See page 242 of the Lyons history. The First Food Empire. If this is not the product then it was probably a Wall's line. Fourteen new ice cream were launched in 1972. Some targeted at teenagers and others for adults. There was the 'Angel'. A strawberry and vanilla kreeme ice, half of it choc coated. The adult hand-held ice creams were 'Dark Satin' (vanilla ice cream coated in dark chocolate at 5d), 'Nutcracker' (hazelnut pieces in vanilla ice cream with dark chocolate coating at 6d) 'Cornish Treasure' (Cornish dairy ice cream with super-fine dark chocolate coating at 7d) and of course 'Caramel Gold'. This was made up of slices of vanilla and caramel ice cream with a light chocolate coating. It was priced at 6d. Or could it have been a children's ice cream launched in the Spring of 1975 under the unlikely name of Super Toffee Swisho. It was two thirds chocolate ice cream with a toffee centre and one third vanilla ice cream It sold for 7p. I wonder if you can assist me with a little challenge? My 84-year old father, whose full name is Edward William Thomas, has been telling us recently of how he was, for a time, the smallest page-boy in Britain when he worked at the Strand Palace Hotel. This would have been around 1932, when he was aged 14 and measured a whopping 3' 6.1/2''. The half inch was all important, because six months later a lad by the name of Johnny Maguire came along, who was a mere 3' 6'' tall. He tells me that one edition of a Lyons magazine featured a photograph of the Strand Palace Hotel doorman (who measured 6' 5'') together with my dad and his pal Johnny Maguire. My dad was perched in the crook of the doorman's arm, with his feet just touching the top of Johnny's head. My quest (which I haven't spoken to him about as I'm not holding out much hope of success) is to try and find a copy of this photograph, or any other mementoes of these long ago days. Fortunately, he sprouted to a more reasonable height in his later teens, and I certainly haven't suffered, standing as I do at 6' 2''!! I have turned out a coloured photograph (a bit faded) which depicts a Lyons 'Aroma Sealed' coffee tin in green, black and yellow. The background label is green. On this is a black rectangle and printed on the rectangle, in yellow lettering, is 'Lyons Coffee'. Between the words 'Lyons' and 'Coffee', and printed in green is 'Pure Ground'. The black rectangle has a yellow border. Underneath the black rectangle, and printed in yellow, are the words 'Aroma Sealed'. At the bottom of the label, and printed in black, are the words, 'Half Pound Net'. 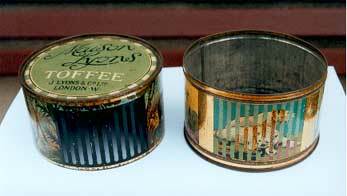 On the top of the tin is a sardine-can-like key to open the coffee tin. It is difficult to say whether this tin has any value. To a collector of these items it must have some value but I doubt whether this would be very high. In the UK you might get £5-£10 I guess. The date of manufacture is hard to estimate since no factory production records have survived (to my knowledge). If these were available the numbers on the base may have given some clues. The coffee was produced at the Greenford Factory, Oldfield Lane, Middlesex, England. I can say that it was produced in about 1965. Certainly not after 1967 as my photograph bears the telephone number of the photographer. This is given as Fremantle 7881. These prefixes were changed to all-number figures in July 1967. The coffee is probably drinkable, providing the air tight seal has not been broken. However, it will be of more value if it is left in 'mint' condition. I hope this may be of some help. The code 4111 printed on the bottom of the tin refers to the packing date:-4th:day - 1st:week - of the 11th: month The year was never shown.